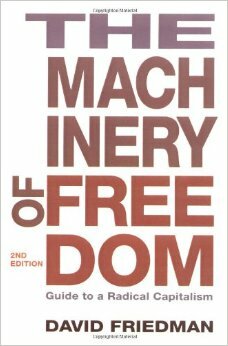 David Friedman recently published the third edition of Machinery of Freedom, his classic book on anarcho-capitalism. Even after 40 years it is still a great read for both fledgling and seasoned libertarians. Friedman does his best work using economics to describe how, and why, anarcho-capitalist institutions could, and should, be developed. He gives an excellent historical examination of Iceland, which had a legal system that showed how some libertarian ideas would work in practice. In Chapter 37, he also has some wise words for radicals about civil disruption, discussing how shock tactics and property damage will only instill in people a desire for strong government. He warns that anarchists should avoid traditional revolutionary techniques used by those who want to usurp government power because the same strategy does not work for destroying government power all together. It should be noted that this book is not just an historical tour of libertarianism. Friedman includes many modern topics, including crypto-currencies and anonymous online markets. Rather than take a broad look at the different areas where Friedman shines on well traveled topics (global warming, private courts, market derived law) and nit-picking other areas (pollution, foreign policy, writing style), this review will focus on the implications Machinery of Freedom has for libertarian ethics. This is because the most important contribution of his book 40 years later is not the libertarian answers he was able to find but rather those questions that he has been unable to identify solutions for after all of these years. In this way, Friedman lays out clear challenges to young libertarian thinkers who are working on the next generation of libertarian insights. This entry was posted in book and tagged anarcho-capitalism, book review, continuum problem, David D. Friedman, economics, ethics, Five Murrays, Machinery of Freedom, NAP on September 30, 2014 by rothbarddotcom.